Cooking with Gochujang by Naomi Imatome is the first book of it's kind to highlight this ancient Korean hot sauce. 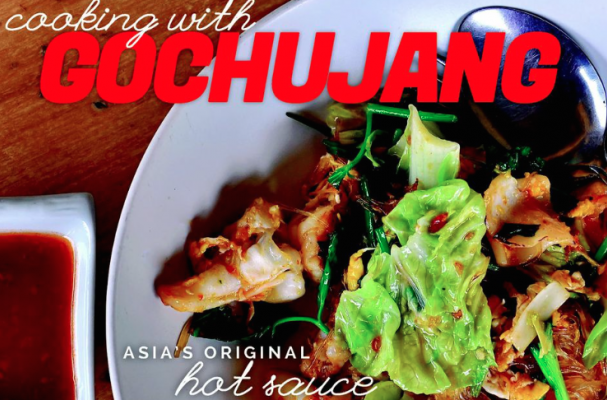 Sriracha opened the gateway for Asian hot sauces and now gochujang is making a name for itself. It's distinctive red color and complex flavor is made by combining red chiles with miso paste and sweet glutinous rice powder. It's traditionally added to dishes like kimchi and bibimbap but now has expanded into salad dressing, soups, stews, marinades and more. Gochujang is a versatile hot sauce that is worth keeping in the kitchen. There are many people who go on and on about how perfectly gochujang complements pork. I do agree that gochujang goes well with pork—but I also think those people tend to really love pork in general—because gochujang also goes well with seafood, vegetables, and even cheese! Regardless, this tasty gochujang and ginger pork recipe is one of my favorites to serve over rice or in lettuce cups. In a large mixing bowl, combine all the marinade ingredients (everything except the pork) together and mix well. Add the pork and stir to coat all of pork with marinade. Marinate for at least 30 minutes. Heat up a griddle pan, wok, or heavy sauté pan over high heat. Turn down heat to medium-high and add marinated pork. Flip or turn the pork regularly and cook until pork is fully cooked and is not pink inside. Serve in lettuce wraps or with vegetables over rice. 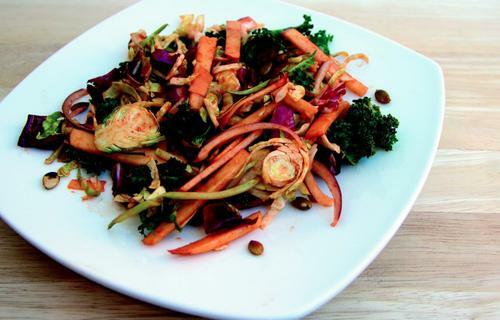 A powerful gochujang salad dressing can stand up to the crunchy, firm textures of shaved Brussels sprouts, kale, and red cabbage. The apple adds some sweetness and the red onion and avocado add dimension to this hearty dish. Toss all the salad ingredients together. Top with a generous amount of gochujang vinaigrette. This is an amazing dressing for salads. I especially love to use it on soba salads and cold shrimp and chicken dishes. Excerpted from Cooking with Gochujang © 2014 by Naomi Imatome-Yun. Photos © David Y. Yun. Reproduced by permission of Countryman Press, a division of W.W. Norton & Company, Inc. All rights reserved.